As expected, the BBB of C have done the right thing by ordering an immediate rematch for Enzo Maccarinelli and Shane McPhilbin. The reason why a rematch has been ordered is because the first round was cut short by about forty seconds at a vital point in the fight. 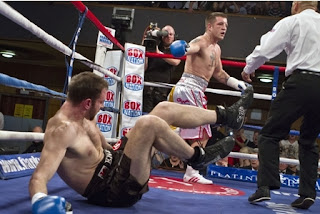 McPhilbin knocked Maccarinelli down with less than a minute left in round one, Maccarinelli got up but it was obvious that he was badly hurt and when the bell ended for the end of the round, the viewers at home could see that there was forty-seven seconds left in the round. The timekeeper for the fight has been suspended of his license until the 1st of January 2013. Even though a rematch has been ordered, I can't see the fight happening. I think Maccarinelli will choose to retire, and based on his last performance, this would be the right choice. What do you think? Will the re-match happen?